Joseph Richard (Joey) Jay (born August 15, 1935) is a former starting pitcher in Major League Baseball. From 1953 through 1966, Jay played for the Milwaukee Braves (1953–55, 1957–60), Cincinnati Reds (1961–66) and Atlanta Braves (1966). He was a switch-hitter and threw right-handed. In a 13-season career, Jay posted a 99–91 record with 999 strikeouts and a 3.77 ERA in 1546.1 innings. In July 2008 he was inducted into the Cincinnati Reds Hall of Fame. In addition to being the first Little League player to advance to the major leagues, Jay was one of the first "bonus baby" players in the major leagues. This resulted when he signed a significant contract ($20,000) with the Braves, which forced the Braves to keep Jay on their major league roster for two seasons because of the contract's amount. On September 20, 1953, at the age of 17, making his first career start (having pitched only one game in relief previous), he pitched a seven-inning complete game shutout (the game was shortened due to rain), but generally was unremarkable in his two years with the team. Following the end of his two years, he was sent to the minors to gain experience on a staff that already was loaded with Hall of Famer Warren Spahn, Bob Buhl and Lew Burdette. Jay went 7–5 with an ERA of 2.14 in 18 games for the Braves in his best season (1958), becoming the first pitcher (fourth player overall) to win the NL Player of the Month award in July (going 5-2 in 7 starts, posting an ERA of 1.39, and earning 46 SO in 58.1 IP) but a broken finger kept him out of the World Series. The Braves traded Jay to the Cincinnati Reds after the 1960 season for infielder Roy McMillan. Braves General Manager at the time, John McHale, reportedly made the deal based on the feeling that Carl Willey could do a better job for Milwaukee than Jay. 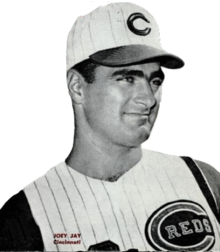 Jay took full advantage of the trade, as he became a key figure in the Reds' stunning revival in 1961. Jay won 21 games (the first Red to win 20 since Ewell Blackwell in 1947), tied for the league lead in wins and shutouts, and won his second NL Player of the Month award in May (winning all six starts including a 4 May one-hitter against the Phillies, a 2.72 ERA, and 38 SO in 51.2 IP) as the Reds surged to their first National League pennant since 1940. However, the Reds faced a powerful New York Yankees that won 109 games and featured Roger Maris, Mickey Mantle and Whitey Ford, as the Reds lost in five game. However, the lone Reds' win occurred in Game 2, a 6-2 victory as Jay threw a complete-game four-hitter at Yankee Stadium. Jay's single-game career highlight. On May 1, 1962, at the Polo Grounds, off New York Mets pitcher Sherman Jones, Jay hit a three-run HR (base runners were Wally Post and Leo Cárdenas), in the 6th inning, for his first MLB home run. At Crosley Field, on May 28, 1962, Jay hit his only other career home run, off Houston Colt .45s pitcher Bobby Tiefenauer, in the 5th inning, a two-run blast (Don Zimmer was on base). Jay also won 21 games in 1962 as the Reds won 98 games to finish in third-place behind the Giants and Dodgers. Jay's heavy workload in 1961 and '62 took a toll the following year as he struggled to a 7–18 record. Jay posted a (11-11) in 1964 as the Reds finished a single game behind the eventual World Series champion St. Louis Cardinals. He would finish his career by returning to the Braves for their initial season in Atlanta in 1966. ↑ Russel, Shannon (2008-07-20). "Reds hail HOF inductees". Cincinnati Enquirer.